Want to learn a printmaking technique that you can do at home without the expense of buying a traditional etching press? Using a portable die cutting machine you will learn how to create simple drypoint and collagraphy prints. These are both fun, creative and immediate forms of printmaking. You will learn how to ink, wipe and print your plates, leave with a pile of prints and ideas for many more! 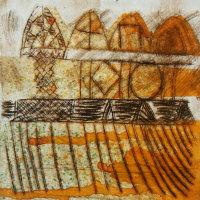 Drypoint is the printmaking technique which is closest to drawing, since the tools are held like a pen. However, you need not be skilled at drawing, as you will be using transparent plates which offer the option of ‘tracing’ a preparatory drawing or photograph. Collagraphy involves cutting into a sealed card plate and tearing off the surface, where you cut will hold the ink for printing. Suitable for both beginners and those with some experience. Please bring an apron or old shirt to protect your clothing.